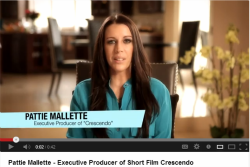 Pattie Mallette, best known to millions as Justin Bieber's mom, has signed on as the executive producer for the new short film, "Crescendo" [from the producers of the pro-life film "Bella"). Based on a true story, "Crescendo" takes place in the 18th century Holy Roman Empire where a series of events turn an ordinary day into an extraordinary experience that changes the life of one woman. . . .
"Crescendo" has already won numerous awards at recent film festivals including the Crystal Heart award at the 2011 Heartland Film festival and top short film honors at the Hollywood Film Festival. The Texas Bishops invite all Texas Catholics to Catholic Advocacy Day in Austin on April 9. To learn about the Bishops’ legislative agenda and the skills to be an effective advocate, join us for the kickoff training on Feb. 16, featuring Jennifer Carr Allmon from the Texas Catholic Conference. For more information and to register, visit dallascatholicadvocacy.org or call 214.520.6590 ext. 124. Sponsored by the Diocese of Dallas, Catholic Charities of Dallas, Catholic Pro-Life Committee and St. Vincent de Paul Society. McKinney will be one of many cities joining together for the largest and longest coordinated pro-life mobilization in history – the 40 Days for Life campaign. The McKinney prayer vigil will take place from 7 a.m. – 7 p.m. daily outside the McKinney Planned Parenthood abortion referral center. (Please stay on sidewalk and do not park in business strip where Planned Parenthood is located.) For more information, visit 40daysforlife.com/mckinney. Sponsored by 40 Days for Life-McKinney. Note: The CPLC covers the 5 Dallas abortion centers in prayer and counseling daily throughout the year. For more information, see prolifedallas.org/sidewalk. It’s a fact that chemical abortions are on the rise. Abortion mills rely heavily on the abortion pill known as RU 486. This procedure is intended for use to seven to nine weeks of pregnancy. It’s a multi-stage process that begins with a drug called mifepristone, which blocks progesterone, causing the uterine lining to break down. Approximately 36 to 72 hours later, another drug is taken to cause contractions and expel the dead baby. . . .